President Muhammadu Buhari on Friday left the country to attend the Paris Peace Forum scheduled to begin on Sunday and end on Tuesday, said Mr Femi Adesina, Special Adviser to the President on Media and Publicity. The Peace Forum organised by the French Government and a number of Non-Governmental Organisations (NGOs) will host over 70 Heads of State and Government, representatives from top international organisations and stakeholders from civil society. During the visit, President Buhari and other world leaders will commemorate the centenary anniversary of the Armistice agreement signed on 11th November of 1918 between the Allied Forces and Germany in the forest of Compiegne in France to end the First World War. Buhari will also have an interactive session with the Nigerian Community in France. The President is expected to be accompanied by Katsina state Governor, Aminu Masari; Governor Willie Obiano of Anambra State and Ekiti State Governor Kayode Fayemi. Others include Geoffrey Onyeama, the Minister of Foreign Affairs; the Attorney-General and Minister of Justice, Abubakar Malami; the National Security Adviser, retired Maj-Gen. Babagana Monguno; and the Director-General, National Intelligence Agency, Ahmed Abubakar. The forum will center around five topics, peace and security, global environment, global development, new technologies, and a global inclusive economy. 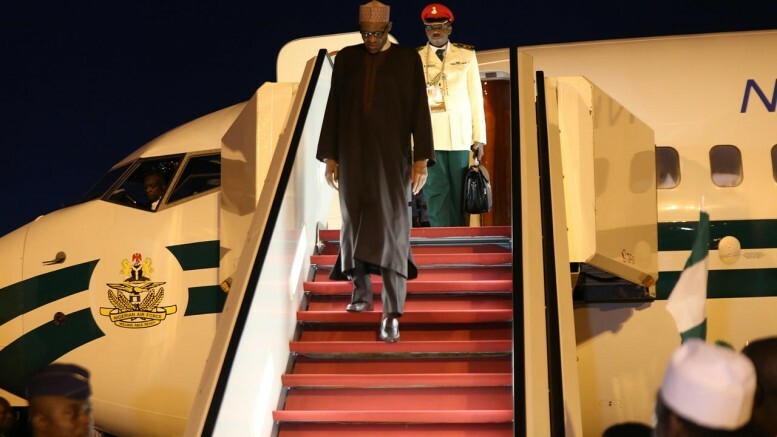 Be the first to comment on "President Buhari Leaves for Paris Peace Forum"